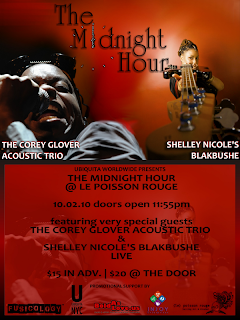 Living Colour Blog: Corey Glover Acoustic Trio - Oct 2nd MIDNIGHT! Ubiquita Worldwide debuts a new late night live music series, THE MIDNIGHT HOUR @ LE POISSON ROUGE. THE MIDNIGHT HOUR was conceived as an homage to the classic 70's- early 80's tv show 'Burt Sugarman's Midnight Special' and will be a series of midnight double-bills with a concentration in Rock & Soul. The series will launch on Saturday October 2nd in the heart of NYC's Greenwich Village with SoulaRoc Diva SHELLEY NICOLE'S BLAKBUSHE & THE COREY GLOVER ACOUSTIC TRIO - a brand new offering from the famed frontman of Grammy Award winning Funk/Metal Icons Living Colour. $15 in adv. $20 @ the door. For tickets: http://lepoissonrouge.com/events/view/1542.